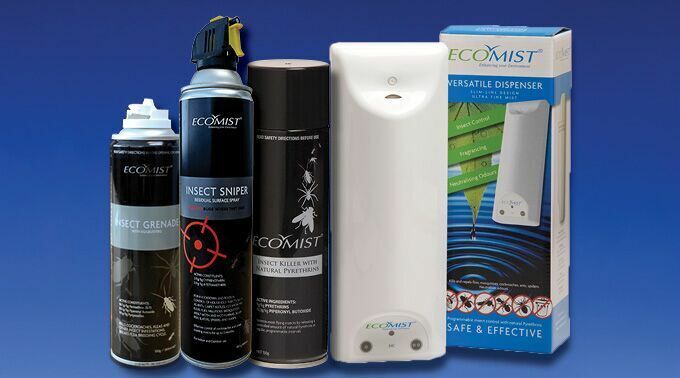 Ecomist is a New Zealand owned international franchise network specialising in providing Insect, Pest and Odour Control, along with Fragrancing & Hygiene products to both commercial and domestic markets. Ecomist was born as a result of the NZ invention of a sophisticated automatic aerosol dispenser. The dispenser, when used with a spray containing natural pyrethrins from the chrysanthemum daisy, was able to effectively control insects while remaining safe for humans. Ecomist’s range of insect and pest control products have been developed to cater for both residential and commercial settings. Later, the product range was extended to offer in-room fragrancing. Ecomist’s same dispenser technology could be used to deliver fragrancing and control odour through dispensing regular, small sprays of the fragrancing product. Ecomist went on to develop an extensive range of odour neutralisers using high quality French perfumes which has proved extremely popular with both commercial and residential customers. Some customers have even worked with the Ecomist team to develop their own signature scent, creating a unique ambience for their environments. Ecomist operates a nationwide franchise network within NZ and AUSTRALIA and supplies products to distributors in South Africa, Korea, China, Singapore, Hong Kong and the Philippines. In NZ, Ecomist products are available for purchase online, by phone or directly through one of our 18 franchisees nationwide.